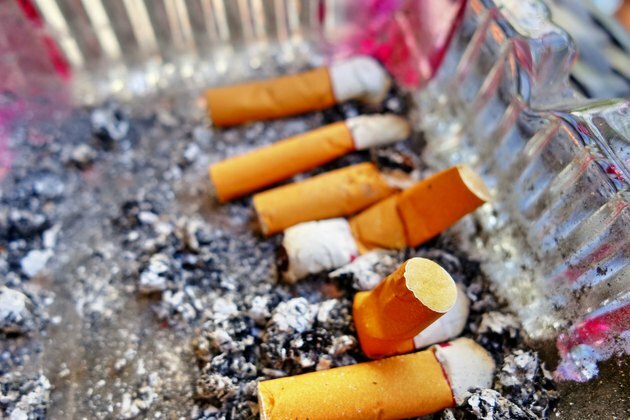 Does Quitting Smoking Help You Lose Weight? Christine McKnelly is a writer and registered dietitian working as her state's coordinator for the Governor's Council on Fitness. Her writing has appeared in numerous publications including the "Encyclopedia of Arkansas History and Culture," the "Arkansas Democrat-Gazette" and "Monday Escapes" online travel magazine. In 2011, her narrative essay, "Should Have Gone To Annandale" placed among the top 10 finalists in Leap Local's international travel writing contest. The fear of weight gain may be one of the most dreaded consequences of quitting smoking -- especially among figure-conscious young women. It’s true that kicking the habit might cause you to go through weight fluctuations, but weight gain is not a sure thing. In fact, the lifestyle changes that go hand in hand with smoking cessation may be more likely to trigger weight loss. The idea that quitting smoking could help you lose weight may seem counterintuitive, until you realize that cigarettes have been limiting your ability to exercise effectively. One of the best examples of smoking’s impact on exercise comes from the Naval Health Research Center in San Diego, where researchers examined whether smoking might affect the amount of exercise, physical performance, endurance and fitness among Navy personnel. This often-cited study revealed that men who smoked not only exercised less but displayed a lowered threshold for cardiovascular, respiratory and muscular endurance. The most exciting news about weight loss and smoking may be that quitting smoking can help reduce pesky abdominal fat. While this fat is unsightly, it’s also dangerous because it surrounds your liver, intestines and other abdominal organs, bathing them in hormones, fatty acids and other biologically active chemicals. Although it’s tempting to blame belly bat -- also called visceral or intra-abdominal fat -- on your diet or genetics, doctors at Harvard Medical School advise that smoking makes you more likely to store fat in your abdomen. This means that even if you don’t lose a pound after you quit smoking, your abdominal fat stores may shrink as your body begins to store fat in less noticeable places just under your skin. In fact, the type of fat stored under your skin helps suppress hunger by releasing hormones that suppress your appetite. It’s a win-win if you’re trying to lose weight. One of the most overlooked aspects of how smoking influences weight is that smoking is a sedentary activity. If you work at a desk and only step away for a smoke break, there’s no time left for any physical activity during your work day. Turning that smoking time into a chance for a brisk walk will not only recharge your mind, but you’ll burn calories to offset the metabolic changes your body goes through once you quit smoking. Once you make the decision to improve your health, quit smoking and possibly trim your waistline, don’t be dismayed if friends tell you that weight loss is going to be impossible. Although some people gain weight when they stop smoking, the science speaks for itself -- and has proved that smoking does not increase muscle in laboratory animals or provide any beneficial long-term boost to your metabolic rate. Focus on the positive aspects that will help you shed pounds, like the extra time you’ll find for exercise and the extra boost of endurance you’ll feel once you kick the habit. Can You Exercise & Smoke? What Can Smoking Do to Your Circulatory System? Does Smoking Speed Up Your Metabolism?